Have I told you how much I hate Wal-Mart? Have I told you about the vendors that I know who have been driven into bankruptcy by them? Have I told you about my encounters with their buyers in Asia? No? Well, we'll leave all that for another day. Yesterday, I went to Wal-Mart. I was already in the neighborhood (Plano) doing some Christmas shopping and I decided to pop in for a moment to check on one particular section. Remember the announcements that were made with great fanfare about Wal-Mart making some upgrades to their product lines and displays in a few particular target markets? They opened a new store in Plano last year and have used that store to test upgrades to the product lines as well as the interior finishes and even the exterior building materials. Because of my line of work, I was particularly interested in all the noise made about their new home decor section that was to rival Target and maybe even Crate and Barrel, Pottery Barn, etc. To that I said, "Yeah, right." But the majority of the press was not as skeptical as me. MSNBC said "Wal-Mart turns attention to upscale shoppers"
Forbes said: "Wal-Mart Goes Upscale"
USAToday said "Wal-Mart turns attention to upscale shopper"
BusinessWeek said "Wal-Mart Fishes Upstream"
CBS News said "Wal-Mart Targeting Upscale Shoppers"
DSN Retailing Today touted the new store in "The Plano Truth about the Future of Cheap Chic"
It was a huge deal in the industry. Every trade magazine did a story about it. But so few in the industry (and apparently in the press) ever took the time to visit the store and see what all the hype was about. If they had done so, they would have found very little there other than hype. At the time of the opening of the experimental new store in Plano, I was working in New York. But as soon as I could, I went to this "ground-breaking" new store and was flabbergasted by what I saw. The new home decor section that was supposed to be so revolutionary contained the most pedestrian of decor items clearly sold to the company by small, desperate importers based in the US. The items were poorly designed, poorly merchandised, poorly displayed, poorly coordinated... End-caps had been chopped into 3 foot display sections- this was revolutionary? Didn't Target first do that like 10 years ago? I was underwhelmed. Then in a reversal, Wal-Mart began to pull back on these advances and the International Herald-Tribune said "Wal-Mart's new strategy goes back to basics: Saving money." 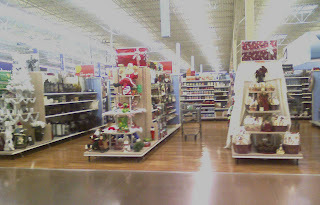 The Plano store was to retain it's unique sections but their expansion to other locations would be scaled back. Clearly this had not been the money maker that Wal-Mart expected. The special sections are still there and contain a different mix of merchandise. They still use this store to test items in all departments. You see many items there for only a week or two then they are gone for good. Or you see items there for months and months with bright red sale stickers which seem unable to entice buyers. So back to yesterday, I went to the much ballyhooed home decor section and snapped a couple of photos for all of you who are unable to see this ground breaking prototype in your area. I know you will be jealous. There it is, in all it's glory. The home decor section that was so "revolutinary." This is the section that DSN said "bears the badge of radical retailing primarily because of how it symbolizes the quantum leap that Wal-Mart has made over the last two years in its ongoing crusade to become a more fashionable retailer." Radical retailing? Quantum leap? The aisles are a bit wider and the end-cap shelves are new, so are the display boards behind the shelves where you would normally see prices in huge font and the smiley face. But, "radical?" The end caps are telling the three main color stories for the season. I know this is new for Wal-Mart. They have never been color or theme driven. I guess this is a big step for them. This season they are featuring: Black/White, Traditional Red/Green and Burgundy/Gold. Not exactly ground breaking. Let's look at the individual displays. 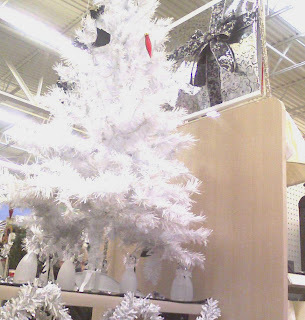 So they have a white tree with a single red ornament placed randomly about 8 feet above ground and the tree is surrounded by the same old acrylic table pieces that have been retailed by so many stores over the last 8 years. (In fact, Wal-Mart has driven everyone else out of that acrylic business because they have driven the prices so low. Meanwhile the manufacturer of those items is forced to front the cost of every mold himself. They can run from $40,000-75,000 each.) But back to the display, the backdrop has been wrapped as a present including bow. 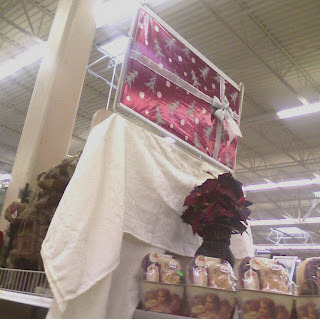 And a white garland has been taped (with tape visible) around the edge of the shelf. Do you see the "quantum leap" now? The red and green section features the beautiful "wrapped package" backdrop, randomly placed bead garland and a large hollow resin Santa. And what about the product? 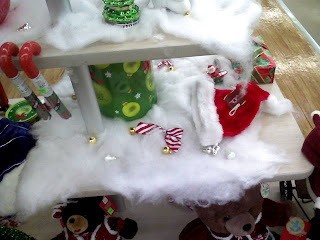 Here is the merchandise described as "trend-right"- some stuffed bears, cookie tins, Santa hats and candy filled plastic canes- all of which were available in K-Mart circa 1972 (and before.) And that snow and the random bows! I don't think I need to say anything else about those. The burgundy and gold section again features the "wrapped present" backdrop but this time it is accented by graceful sweeps of wrinkled tablecloths taped (!) to the fixture. And the merchandise? 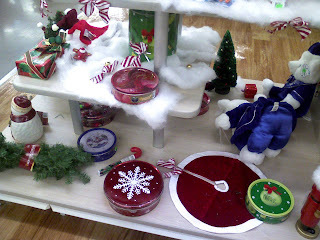 All the shelves were filled with the same cherub adorned tin buckets full of soap and body lotion. I'm not sure if the poinsettia is there as decor or stock. I don't expect to go into a Wal-Mart and be blown away by their product design. They don't design anything except their plan-o-grams. They rely on vendors to design their product. They don't develop items. They expect their vendors to assume all those costs. 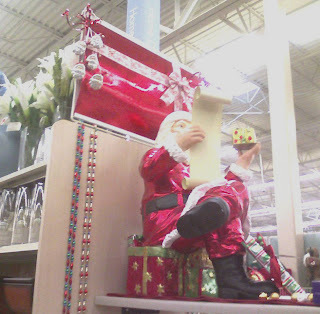 I don't expect to go into a Wal-Mart and be blown away by their product displays. There really is only so much one can do with 127 jars of pickles. What I do expect is a full retraction from all those industry press people who fell all over themselves breathlessly reporting on how this Plano store was going to revolutionize retailing, how Wal-Mart was going to lead the way in design, etc., etc. They should have known better. You don't revolutionize product design without investment and Wal-Mart seems completely unwilling to do that. They are so price-driven they probably never will. You don't puts some shelves on an end-cap and claim to have made your stores upscale. "...even if it takes these upscale offerings several years before they 'pass the Plano test' and begin showing up in regular Wal-Mart stores, the mold is already cast for the future of fashion at mass retail. For anyone who competes with Wal-Mart, it means fashion may no longer be the most meaningful point of differentiation." I think a correction should be printed. The differentiation is definitely still meaningful. 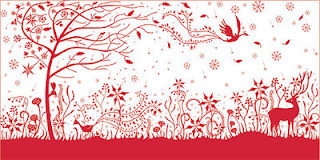 Afterall, the other retailer whose market share Wal-Mart was after, Target, had Tord Boontje do their in-store decorations last year. Compare this to the other photos. I think it sums the situation up nicely. yes, thank God for the blurriness actually...if I had seen that tape, I would have had to scream. it is the cradle of all nasty american consumerism and obesity. But it was so interesting to read it from a professional's point of view. The few times I've gone into the store I've felt just my own personal visual/aesthetic/moral misery. Whereas at Target I feel that warm 'Happy, Happy, Spend, Spend!' glow. Now I know why.